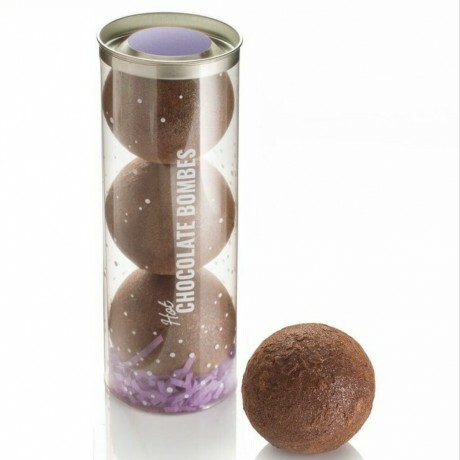 As the cold weather sets in our hot chocolate bombes are just perfect for keeping warm with Belgian milk chocolate balls filled with marshmallows and finished with cocoa powder. Pop one in a mug and like magic watch marshmallows pop out as you pour over hot milk. A lot of fun and tastes delicious! Milk Chocolate (min 33.6% cocoa, 20.8% milk solids.) Sugar, cocoa butter, whole milk powder, cocoa mass, emulsifier: soya lecithin, natural vanilla flavouring, glucose-fructose syrup, water, gelatine, anti-caking agent: maize starch; colour E162, flavouring, cocoa powder, acidity regulator (potassium carbonates), Titanium Dioxide.